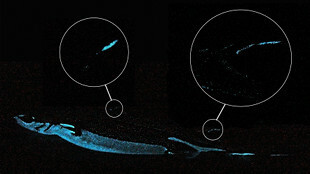 Bioluminescent arcs on a deep-sea lantern shark’s dorsal side highlight its spines. The velvet belly lantern shark has spines on its back for self-defense—and it advertises them to predators with two bioluminescent arcs on its dorsal fins. 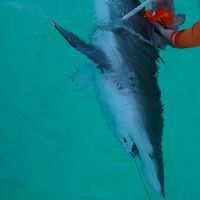 The arcs either mimic the spines or illuminate them in order to scare off predators, according to a paper published today (February 21) in Scientific Reports. 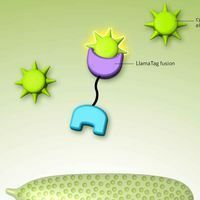 “It’s a way to say: ‘Don’t bite me, I’m dangerous, I have spines on my back,’” Julien Claes, one of the paper’s authors and a biologist at the Catholic University of Louvain in Belgium, told BBC News. 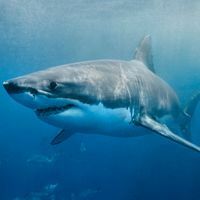 The sharks, which are less than 60 centimeters (24 inches) long, live 200 to 1,000 meters (around 700 to 3,300 feet) below the surface. Animals at this depth rarely have glowing backs unless they’re predators trying to lure prey towards them. But the paper’s authors said that the velvet lantern shark may use the light that shines through their translucent spines to warn predators that they will be a painful meal. 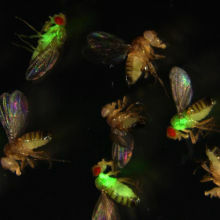 The researchers added that the glow would be visible from several meters away—a good distance for scaring off potential predators but likely too faint for their main prey, the pearlside fish, to see. The velvet belly lantern shark also has a glowing underside, as do some other animals living deep in the sea. Its purpose, in contrast to its glowing spines, is to hide the shark from predators watching from below by matching the light coming down from the water’s surface.